While working on this book, I read an article in the New York Times Magazine wherein an immensely wealthy man, discussing plans for his proposed $30 million house (not including land; a huge sum for 1995), is quoted as saying he wants the 'greatest bathroom in the world.' Since the notion of 'great bath' is an underlying theme of this book, I wondered how, exactly, would this gentleman define the term? And noting that he had hired Frank Gehry, one of the most esteemed architects of this moment, how, I speculated, will the bath turn out? Would I too, if I were super-rich, hire an illustrious designerarchitectural, interior, or industrialto create my ideal bath? Straining my memory, I could only recall ever seeing two or three designer-created baths that were not oppressively sterile, boring, or mannerist caricatures of some historical model. And what possible qualifications would recommend a design professional for the task anyway? Extraordinary sensitivity? The ability to get things done? Among designers I have seen little evidence of the former, when it comes to baths anyway, and any competent contractor can do the actual construction. True, designers are often knowledgeable about hardware and mechanical systems, and baths are indeed indebted to reliable means of water delivery, heating, disposal, and so forth. 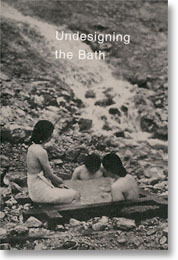 But technological virtuosity in the service of bathing, the hallmark of the typical designers approach to bath creation, is, in my opinion, a minor virtue considering the total constellation of elements that constitute a great bath. The bath, I feel strongly, should be a place to escape from the depredations of the technological world, not revel in them.